Falmouth is Cornwall's largest town, but it is also a popular tourist resort and features a busy harbour and wide sandy beaches, which are ideal for families. The bustling town centre features high street shops and specialist shop selling crafts, seafood and watersports equipment. One of the principal tourist attractions is Pendennis Castle that faces across the harbour to St Mawes Castle and defends the harbour. Also suitable for all weather is The Falmouth Maritime Museum. Falmouth has won its place on the culinary map with some wonderful seafood Restaurants, including Rick Stein's award winning fish and chips, cafes and bar so something to suit all tastes and budgets from Fine Dining to Pizza, or Just a pasty on the quay. 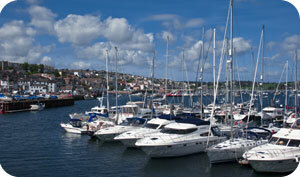 The town of Falmouth is very well known for its harbour, which is the third deepest in Western Europe. There are a wide range boat trips available taking you out into the lovely Falmouth bay or up the beautiful Fal Estuary to the county town of Truro. You can also take the passenger ferry over to St Mawes on the lovely Roseland Peninsula. Falmouth has a long maritime tradition dating back to the days of the tea clippers and there are regular marine events staged throughout the season ranging from gig and yacht racing to races between the local gaff rigged working boats. Numerous epic voyages have started and finished in Falmouth. Ellen McArthur landed at the end of her record breaking round the world trip in Falmouth.